Today’s very special guest is Susan from The Girl in the Little Red Kitchen. Susan cooks in a tiny kitchen but it’s also really gorgeous and decked out in one of my fave colours in the world. I am also completely in love with her dog and think it’s adorable that her blog design has her pug in it with her. To me that just speaks volumes about what an absolute sweetheart Susan really is. She has an impressive collection of Le Creuset that I am seriously envious of. Susan is a really talented cook and I love doing Sunday Supper with her. She’s extremely advanced and tackles some impressive dishes even I have yet to try. You can check out her Bouillabaise a la Marseillaise, Smoked Baby Back Ribs, Cherry Lime Rickey Sorbet, Dark and Stormy Ice Cream Cupcakes and Homemade Nutella to name just a few. Everything she makes looks amazingly delish and I just want to reach into the screen and snag it all. Like this dish she whipped up. I mean a gal who puts fritos in a main dish is a lady after my own heart people. I love her to bits for this wickedly cool recipe. Please welcome Susan to the asylum. Hi! I’m Susan from The Girl In The Little Red Kitchen and I can’t begin to tell you how thrilled I am to be guest posting today here for Kim at Cravings of a Lunatic. Kim is so amazingly talented, and it is an honor to be here today while she drives cross-country. How can you not love a woman who makes Red Velvet Ice Cream Cupcakes, Taco Pretzels, and Deep Fried Pizza!! Did I mention yet that she’s Canadian? Awesome things come from Canada, like hockey, Degrassi (no shame in admitting that I like that show), all the awesome Sci-Fi shows are filmed there and that’s where they find their actors, POUTINE, and Kraft Dinner. Yeah, I went there. Kraft Dinner, the Canadian version of Kraft mac and cheese. Was it any better than the American stuff? No? However, I just like saying the name, makes it fancy. So why am I bringing up Kraft Dinner? Because I’m making mac and cheese and because sometimes I get cravings too, and that craving happens to be often or not, Frito Pie. Then one day a few weeks ago, I had a genius idea, how amazing would it be if I put Frito pie and mac and cheese together? Chili con carne + spicy gooey cheese sauce + elbow macaroni topped with crushed fritos = pure genius! 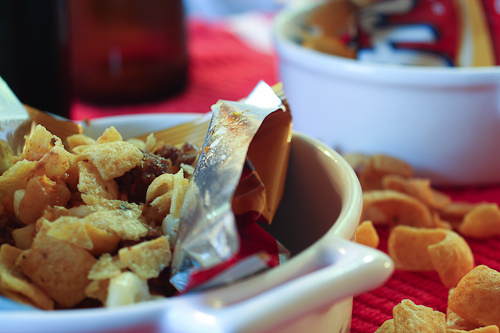 Frito pie is a popular Southern and Southwestern dish made of chili, cheese and crusted corn chips. It is commonly served in an individual sized bag of Fritos with the chili and cheese poured right on top. In a deep set saute pan, brown the meat over medium heat with a little bit of olive oil and drain any excess grease. Add the onions and saute 5-6 minutes until soft. Add the minced garlic, and cook for 30 seconds until fragrant. Stir in the chili powder, cumin, oregano, salt and peppers. Cook for another 30 seconds, and then mix in the stock and tomatoes. Stir to combine and cook on a low boil, uncovered for 20 minutes until thick and most of the liquid has been cook out. While cooking the chili, bring a large pot of salted water to boil and cook the macaroni according to package directions. Drain and set aside. In a medium pot over medium heat, melt the butter. Once almost completely melted whisk in the flour and mustard powder. Cook for a minute to get the raw flour taste out and then slowly whisk in half of the milk. Cook, while constantly whisking for one minute to get any lumps out, then slowly whisk in the remaining milk. 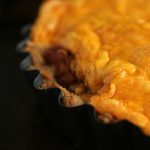 Whisking every 30 seconds or so, cook the bechamel for 7-10 minutes until it is thick and coats the back of a wooden spoon. If your milk starts to boil, lower your heat. You do not want to break the sauce. The best test for thickness, is to run your finger against the back of the spoon, if the line you made stays, the sauce is ready. Turn off the heat, and whisk in the cheese a little at a time. Whisk in more, once the previous batch is completely melted. As soon as all the cheese is melted into the bechamel, stir in the macaroni. In a 9X13 baking dish, pour in your mac and cheese and spread evenly with the back of a wooden spoon. Next layer the chili on top, smoothing the surface, so it is even throughout. Finally, cover with crushed Fritos and bake for 15 minutes to set. Thank you so much to Susan for bring us such a wonderful dish today. 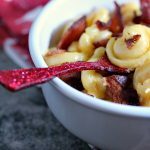 I have to try this Frito Pie Mac n Cheese for my hubs. I’m also going to leave the recipe with B-Dude since this is right up his alley. You might think I’m a bad Canuck when you learn I hate poutine. I know right. They may run me out of the country immediately for that one. Susan I cannot thank you enough for coming to entertain my readers in my absence. You are amazingly talented and so incredibly kind. I appreciate you taking the time to do this for me so very much. Make sure you stop by Susan’s blog, The Girl in the Little Red Kitchen and follow her immediately. You will not want to miss out on any of her yummy dishes. How can you not dig a gal who can turn fritos into such a cool and tasty meal, I am in awe. Make sure you follow her on Twitter, Pinterest and Facebook as well. Us bloggers like a good stalking so make sure you stalk Susan everywhere. You will love her blog, her attitude and her cooking as much as I do. As for me if all is going well, and let’s hope that it is, we should be firmly planted in Alberta today. Setting up shop at our hotel, checking out the area and getting some prep done. B-Dude needs a ton of stuff so a few shopping excursions are in order. We’ll be tooling around Walmart, Ikea and quite likely some second-hand shops trying to get him set up and comfortable. I’m thinking laundry might be order today too. 3 days in the car probably has us all cranky, sore and smelly. Keeping it real folks, keeping it real. 1. I love Susan’s blog. 2. I love the looks of this mac and cheese. NEXT LEVEL. 3. I do not understand how it is possible that Kim doesn’t like poutine. It’s redonkulous. 3. it’s a lunie thing! Great guest post! I have always wanted to make these for my kids… it just fun. 🙂 Well done ladies! I give full credit to Susan, the frito mac goddess. I sent the link to my son cuz he wants to make some cool mac n cheese. My basement is red. Love red. I also have my blog room done in burgandy. Right. Susan rocked this out. Would you believe that when I was a kid (elementary school) my mom packed Fritos in my lunch every day. I still love them today. 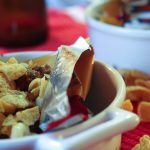 I have not had a Frito pie in many, many years and now this has me craving it. That’s adorable. I love that. What a great food memory. Oh my, it’s only 9:00 am and I’m wanting dinner. I haven’t had Fritos in so many years but they were a favorite when I was a kid. I hope you’re happy, Susan, because you’ve just started a wicked craving that’s bound to result in my pants feeling tight! Ah I love when a recipe brings someone’s diet to their knees. Lol. This is a wicked cool recipe. I sent it to B-Dude to try out. That mac and cheese looks incredibleeeee! Seriously Susan….YUM. There’s something magical about fritos. Haha they seriously make everything better! Those are a Christmas staple at my house.. I know… weird. I like the bbq ones the best. Something about them reminds me of childhood. Frito Pie is one of my guilty pleasures. Seriously good stuff. I’ve never tried the mac ‘n cheese version – sounds awesome! Good guest post – thank you. I’ve not made frito pie yet so I need to add it to my list. I think my son is going to make this version. Can’t wait to see how he does with it. Fritos are just addicting, there is something about them. I think they put something in them to keep people going back! Kim! Thank you letting me into the asylum today! I’ve had a blast! Oh and Movita, about the poutine thing, I think we need to revoke Kim’s Canadian card :-). Susan thank you so much for guesting for me. I am so sorry for the delayed comment, nothing like a road trip from hell and a hospital visit to stall blogging. I am so thankful you agreed to take over for me for the day. It meant so much to me. 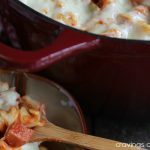 I’m saving this recipe for when I have to feed kids…like me! Great Job Susan..
It’s perfect for kids, and adults, and adult like kids. I want to try it out when I have nieces and nephews over. This will make them love my house even more. Lol! 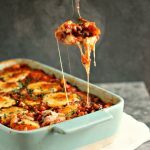 now that is some seriously amazing comfort food – love it so much! She rocked it out today. Love this dish. I popped over and had a look at Susan’s blog. 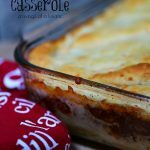 Looks great, just like this dish – good comfort food. She has an amazing blog. You will be hooked! There is not one thing that I don’t like about this recipe!! 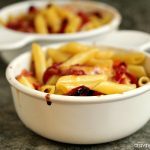 What a wacky dish and a lovely blog introduction! Thanks so much Maureen. Love when you stop by. This might be the most brilliant variation on mac & cheese I’ve seen yet. I am drooling so bad! It’s really cool right. Susan outdid herself. Love the idea to serve in individual Frito bags . It’s so unique and cute. Kids would love it. Damn. I am trapped at work and I want this in the worst kind of way. Nothing worse than a craving at work. Hope you gave into it. Lol!